The Boundary Commission for Wales is late. They had problems which haven’t been disclosed, and two new commissioners were only appointed on 4 October. We won’t know if they are more competent than their predecessors, or more competent than the English commissioners, until their proposals are published in the New Year. In the meantime everyone can have a go at second-guessing them, and I’ve used Boundary Assistant to have a go. Compare my effort with those by Penddu and Phil Davies. 1. The country has been allocated 30 seats, down from 40. This is the most significant change anywhere in the UK, and marks the end of the statutory over-representation of certain areas, apart from the four island constituencies (Shetland & Orkney, Western Isles, West Wight, East Wight). 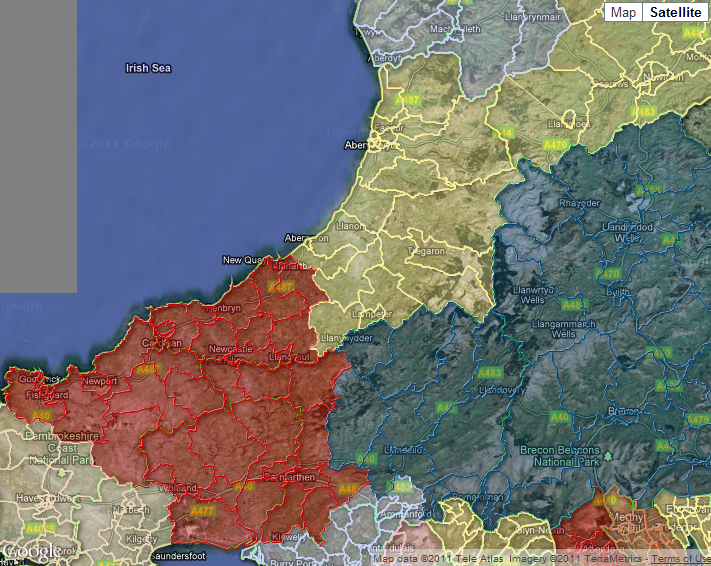 – Some electors from Mid Wales will probably need to be included in a North Wales seat or seats. 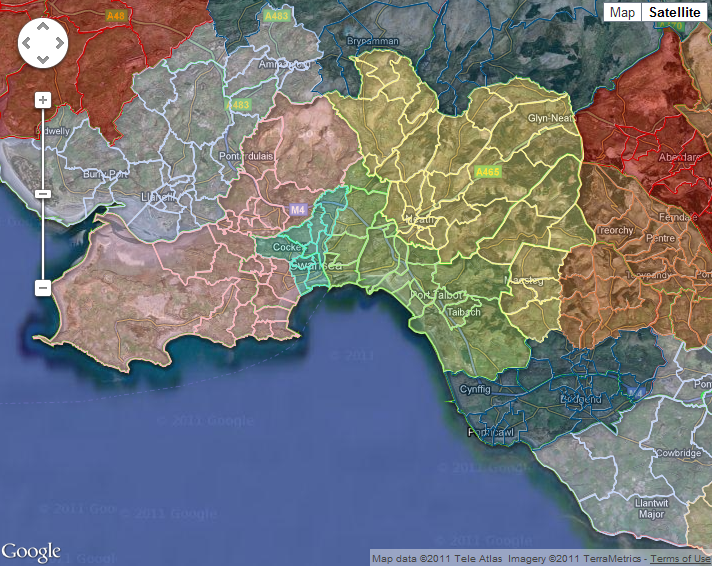 – Depending on the size of the Swansea seats, Maesteg or Porthcawl might have to be included in a NPT seat. I’ve tried to avoid including the Conwy valley in the already large Gwynedd/Meirionnydd seat, but this has the unfortunate consequence of forcing Conwy itself into the Anglesey-Bangor seat, so I don’t think I’m on to a winner there. Further along the coast, Denbigh district has an electorate of 74,416 so, apart from the Llandrillo ward transferred to Gwynedd, I’ve made a coterminous constituency. The Wrexham area is short of voters so needs to include some from North Powys. This isn’t ideal but I think it’s a likely solution. I think this part of my plan will go down like a lead balloon, so look away now. 🙂 Even with some voters in North-Wales seats, Powys is too big for one seat. 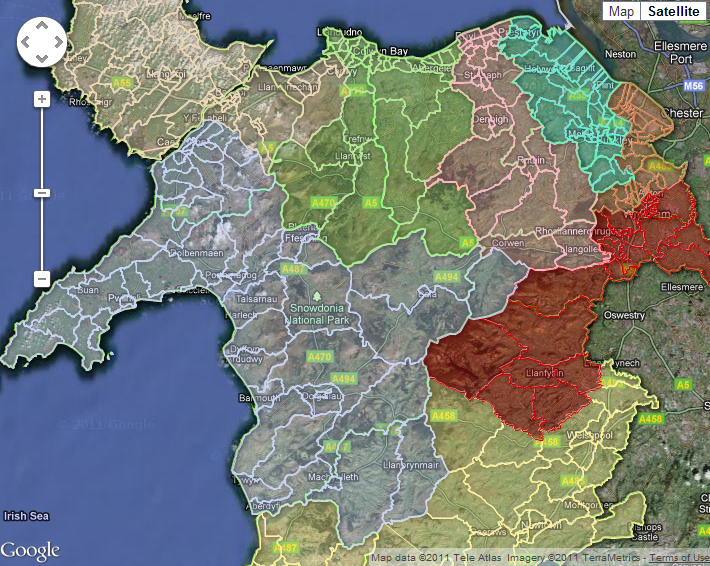 A likely solution is to add the south-Breconshire villages to seats in Glamorgan and Gwent, but if you don’t want to do that, you have little option than to have seats that cross the mountains and split Ceredigion. The seats are perfectly workable but possibly not too popular. There are two seats west of the Tawe and two to the east. 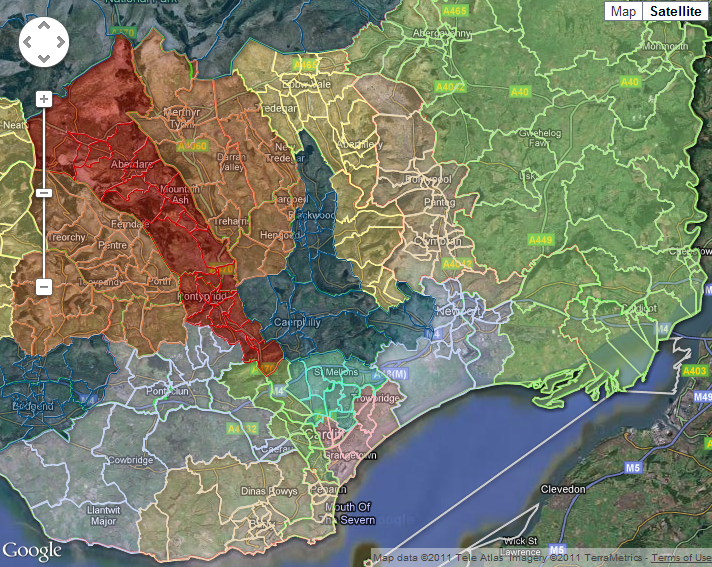 Dividing the East Swansea-Neath-Port Talbot-Maesteg area is difficult. Part of Cardiff district needs to be included in a non-Cardiff seat and I assume that in the end a solution will be found that transfers Creigiau, Pentyrch and Radyr, but my Llantrisant-Cowbridge seat is too small unless I include Ely. Apart from that I’m pretty happy with my plan for the Valleys. I know there isn’t much of a link between Caerphilly and Blackwood, but they are in the same borough. Interesting, but not a flier I suspect.